First off, I don’t know why people read this blog, but it seems to do well. This is not only the record of Blue Table Painting, but also of a human life. I write it for friends and family as well as for clients. I would hope to call you my friends. Last night I came home after a long day in the terrain room. Renn and I spent quite a few man-hours on a super-secret project, which you won’t get to see until about three weeks from now. It will be unveiled at Adepticon. I’m not saying it’s especially good. In fact, after seeing some of the club projects from last year, I know it won’t be competitive in that regard. But hey it’s what we made and there it is. I got home and fell asleep on the couch. I was exhausted. Then I heard the thump of a wide-awake Griffin kicking his door (he lays on his back and kicks the door in protest when he doesn’t want to go to sleep). So I went up there with a blanket and pillow, turned on his waterfall nighlight, read him a story, sung him a song* and then snuggled with him until he fell asleep. Then I fell asleep. It was like 2am when my wife came in and extracted me. Griffin is my special little guy. We have a bond. I understand him. He’s like me. He watches my every move. This morning I got up to find that Griffin had figured out how to peel a hard-boiled egg by himself. He was clutching the peeled egg triumphantly. I think he ate like six of them. I was cleaning egg shells from all over the house. That’s where he’s like me. He knows what he likes and he wants a lot of it. Tamie was up until the wee hours last night going over old journals, photographs, and memorabilia. Her best friend since kindergarten died last week. She has been crying on and off these last days. Anything can set her off. So, this morning she was sleeping in. This morning it was gently snowing, the powderiest of snow that doesn’t stick to the road but piles up six inches deep on the grass and branches. I went for my usual walk expecting to find some peace, but I am just wracked with pain mind, body and soul. I am really out of it. I even made two rounds. But to no avail. What’s going on? We got to church early and actually got a good pew. It was the usual—drawing pictures of dinosaurs for an hour to keep Griffin entertained. The Elders were blessing the sacrament today and that was really a blast from the past (normally, only the younger priests do it). By the end of the day I felt at peace. It was like my heart was a piece of driftwood—light and bleached out by the sun and the shedding of tears. This afternoon I downed a bowl of rice krispie treats and chocolate milk. Yum. And one of my wife’s amazing salads. Yes, she can even make a salad good. Then off to visit my two home teaching families. I’m a huge fan of home teaching. I think there’s an enormous power to looking after someone on a regular basis. Just checking in to let them know they’re loved, wanted, and that someone is there if they need a hand. You NEVER know when someone who you think is strong is having a rough time. Of course, a church program isn’t needed for this… but it doesn’t hurt! Yeah, it all turned out all right. And as of the writing of this entry, I’m watching an episode of Chowder with my daughter. Hi-larious. That one and Storm Hawks are shows I like just as much as my kids. 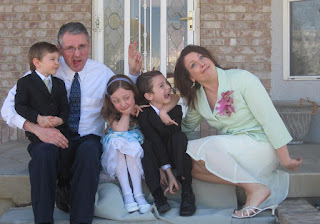 *Popcorn Popping on the Apricot Tree – a Mormon children’s song. 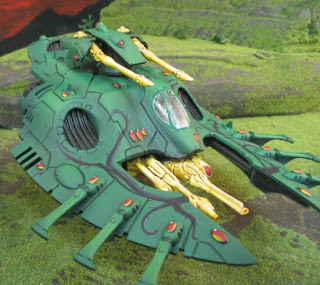 Picture: a Biel Tan Eldar wave serpent. Part of a duo. This waking up at 3am thing is getting really old. Anyway, I have just completed the tenth season of Stargate and tried to watch Ark of Truth (the movie finale) last night but I just passed out on the couch. Then I gave it another run at 3am but only got like 30 minutes in. I spent some time with my beloved wife watching American Idol and eating breakfast (banana and juice). I think I’ve recently updated all projects, so just drop me a line if you don’t know what’s going on with yours. When you see all the people at the studio (on Youtube) that’s only the 10% of the time when artists are down to pick up and drop off projects. We hope to have a communal studio again someday! I share a building with an accounting firm. Handy. What can a large pizza do that an Art Major can’t? Feed a family of four. If you have a project you need by Adepticon, you should contact me right away! Picture: a Terminator from the Dragons of Moloch. It’s a studio army, 230o points and for sale for $1200. You know you want it. This here is a hi-larious 40K web comic. If you haven’t heard of it, you’re really missing out. Last night was really weird. It was like three hours sleeping, two hours awake. Bizarre. I don’t like it. It’s messed up. What’s wrong with me? I spent part of the day in various meetings with businessmen and ‘women working on smoothing out my operation. Renn and Alan were in the terrain room working on some Eldar terrain, which you can’t see yet, it’s a surprise. The big news of the day: Tamie’s best friend, Tonya, was in a car accident and is paralyzed from the neck down and will probably not make it. Many years ago in the pacific rim she was bitten by a cobra which created an avalanche of life long health problems. So, she was not doing so well even before this. Tamie was a wreck talking about how the husband was doting on her and taking care of her. It was a tender scene. So, that meant I had to come home early and pick up the kids from school and take care of them during the afternoon. Which of course means telling the kids in a stern voice to get along and only come see me if there’s blood spurting more than a foot. Hey, I’ve got work to do! Right this instant I’m watching Chowder with the kids. I love that show. Hilarious. Oh, and Storm Hawks is pretty awesome. 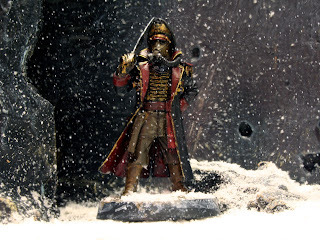 Picture: a Forge World commissar, part of our secret stash of figures for Dark Heresy. 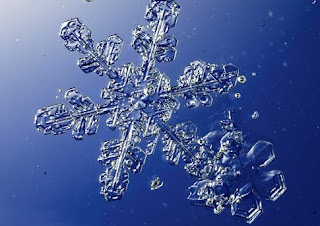 This was both painted and the snow photo-shopped by Renn Smith. 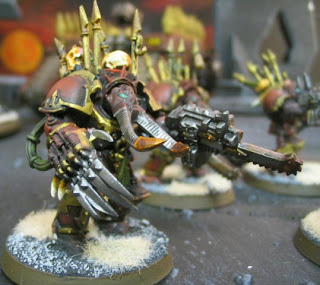 Check out these great resources for Dark Heresy. Download them while you can! Today was the slowest newsday of all. A lazy Sunday morning, followed by church, then Easter dinner (ham and peas). After that I just slept and watched Stargate all afternoon (season 10). 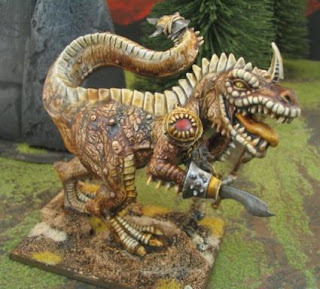 Picture: a conversion for a Chaos Mortals (warhammer fantasy) army. See the rest here. 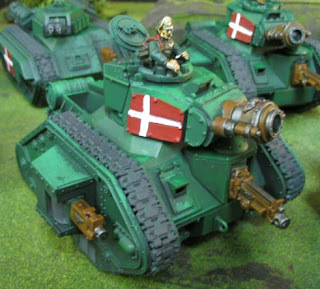 This is one of my favorite armies of all time, I did about 95% of the work and I had a blast with it. I just love to do themed armies. And I like to draw outside GW. Some days it’s just a slow news day. Please excuse the scarcity of game-related material recently. I’ve had a lot going on. Sometimes my breakfast *is* the most exciting thing. I am trying to fill up a few remaining slots for April. I’d love to get those set up in the next week or so. 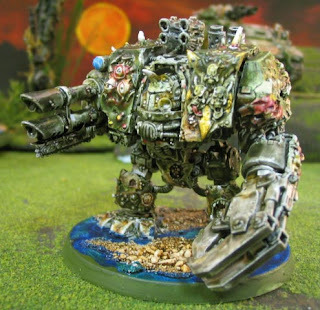 Picture: Forge World Nurgle Dreadnought. I was up at about 5am this morning, corresponding with clients. Sometimes I can’t tell if my body has had enough sleep. I went for a walk. The sky this morning as dawn came up from below the black bowl of the horizon a thousand miles away. It was like I was suspended in the winter air above a lake of dusky blue– if it were any bluer it would have been pitch, and all around the charcoal fingers of trees as if reflected. Well about 7am I crashed again and didn’t get up until about 9pm. It was good. The the Dark Heresy session from 10am to 1pm (my one “fun” thing all week. Oh yeah except running a painting studio). Pretty much the usual after that. Just getting things ready for the coming week. I managed to clear out digital photography. Still looking for a project for painting in mid-April. If you need us to acquire and assemble models we’d best get started right now. I am still very stressed out. I can’t say about what. Let’s just say that this last few weeks I’ve had a convergence of things that have put my mind, body and soul to the test. Just a few quick notes tonight. 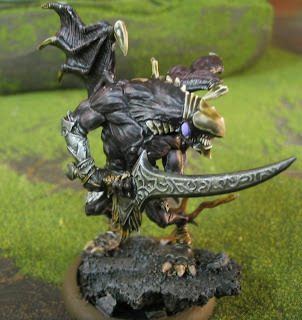 There is a slot open for an army (painting), the week of April 8-16 and wide open after that. The following projects just arrived in digital photography and are looking spectacular. I intend on getting to them tomorrow. This afternoon when I got home from work my wife took off with my oldest daughter leaving me with the two boys (ages two and six). I was sooo tired and I fell asleep on the couch. We have this thing we call “Lord of the Flies”… The two year old dumped a bag of tiny marshmallows on the floor in one room, and pulled all the tissues out of a tissue box in another. Then he crapped his pants, took them off and put the turd in the toilet. I really hope this is after he got the cinnamon cake loaf and was walking around chawing on it! Oh, and he had torn off all his clothes. All these things happened during the reign of “King Slackius IV”.